The Cruciform syndrome indicates a motor deficit corresponding to a brachial diplegia (brachial palsy predominant in comparison to inferior limb paresis). This kind of tetraparesis occurs with acute cervical medullary lesions or trauma. The term man in the barrel also refers to brachial diplegia. However this term is more general (indicating only motor aspects) and is independent from the site of lesions. 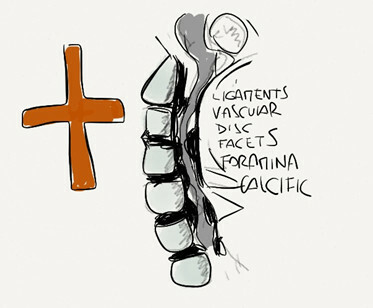 The term cruciform (according to what I remember) should be specific to cases with cervical lesions and refers to the lesion involving the decussation of the corticospinal tract in the bulb-cervical spine junction. In the cervical bulbar pyramidal tracts, crossing of the fibers of the arms is probably inferior than that of the inferior limbs. This is the reason of the predominant superior limb involvement with the cruciform syndrome. I observed this syndrome in patients known for severe cervical spondylosis myelopathy even after minor trauma. If, in these traumatic cases, the motor deficits are severe such as the spondylosis, and the functional status of the patient was good before trauma, a neurosurgical advice and/or urgent decompression+stabilization are warranted.